What is that smell? 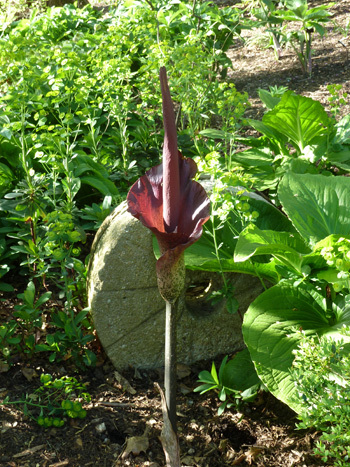 If you are walking through the Terry Shane Teaching Garden it is likely Amorphophallus konjac, the voodoo lily. When mature, the tuberous perennial creates a plastic-like purple inflorescence atop a 2’ speckled petiole. The odor attracts a variety of insects, particularly flies, to aid in pollination. A single leaf, often reaching 5 to 6’ tall, follows the flower. Check out the insects visiting the flower in the video below. Plant Delights Nursery, Inc. lists the plant as hardy to zone 6. Several species are offered. Perhaps the most impressive member of the genus is Amorphophallus titanium, which can reach upwards of 6’ tall when in bloom. The common name, corpse flower, is derived from the overwhelming smell of rot and decay. Botanical gardens, The Huntington for example, grows A. titanium and attracts enthusiastic crowds hoping to catch a glimpse (and whiff) of the bizarre flower in bloom. 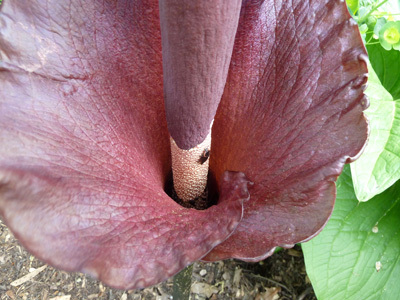 Many thanks to Scott Associates John Wenderoth and Ron Gatto for sharing Amorphophallus konjac with us! John donated the A. konjac that is currently in bloom while Ron shared young tubers which will be perpetuated in the garden. I am planning on attending the 2012 Perennial Plant Conference October 19th….. Excited to tour the arboretum and gardens at Swarthmore…even in autumn! Thanks Ann. We are working on finalizing speakers for this years conference right now. It is shaping up to be a another good one. Hopefully we will have a fabulous fall display for our attendees again this year. See you then. I got my first Amorphophallus Konjac from Plant Delights Nursery some years ago and since that time it has multiplied quite easily. Anyway, Amorphophallus Konjac is in fact easy to grow and the proper candidate if you’re new to growing Amorphophallus or plants of the arum family in general.